In his meeting with the press on media day at the opening of 2018 training camp, Kyle Dubas provided “no update” on William Nylander’s contract situation, expressed confidence in the defense core, discussed the rising expectations in the market, provided his thoughts on the battle for the backup position, and much more. Can you give us an update on Nylander? Dubas: No update. We’re continuing to have dialogue with him. This is not an uncommon situation. There are many of these happening throughout the league with restricted free agents. We continue to have dialogue with their side. When we have an update, you’ll receive it and we’ll go from there. You mentioned it’s not an uncommon situation with William Nylander. It’s your first time as an NHL GM, but you’ve been around hockey your entire life. How comfortable are you in this situation, navigating a training camp with an RFA holding out? Dubas: Very comfortable. It hasn’t changed my day to day whatsoever. We continue to work away at it. We have a very specific process that we are going to follow. With all of our players over the next number of years that are going to be coming up and needing new contracts, we are going to follow the same process. Our goal is to have sustained success here. In order to do that in a salary cap situation, you have to build a structure and abide by it and do things right by the players but also right by the organization and give the collective group the best chance to have success. Things may not move along as quickly as people want as we chip away at it. Patience has always been something that I’ve preached and will live by. I’m confident that we will continue to chip away at it and come to a conclusion here in the coming days and weeks. A busy offseason in terms of changing some things in the hockey structure. Can you talk about the new guys? There seems to be a bigger Tim Speltz influence now. Dubas: Well, I think the fortunate thing for me coming in here for my fifth season with my organization, it wasn’t as though I was coming to an organization and having to learn the ins and outs of it. I knew a lot of the people and a lot of our staff and what they could offer. We were able to elevate a lot of our people internally. Dave Morrison [promoted] to our Direct of Player Personnel – he’s been with our organization for a long, long time and has done an excellent job. John Lilley, Tim Speltz and Ari Vuori will essentially head up our amateur department. We added Wes Clark in player personnel and elevated Jim Paliafito as well. They’re important on our player personnel side, and Troy Bodie becomes our director of pro scouting. We’re very content with our player personnel department and look forward to working with them. No captain seems to be a bit of a trend in the NHL these days. What is your perspective on why, if you could elaborate? Dubas: I think it’s an important distinction. I think, with things of that stature and nature, you never want to rush into it. It’s my first year as a GM of this group. We’ve obviously added a player to our mix that has been a captain for a long time before. We have some excellent existing leaders and we have some young players that have leadership qualities to them that we are going to continue to try to develop. I think patience in this matter is much better in the long run than rushing to name a captain and pacify the demand that we name a captain. I think that best serves the organization and the leaders in our group. It gives you guys something to write about when things are slow, so mission accomplished. Winning a Calder Cup, being a playoff team, having a lot of talent – how different is it to attract talent and sign talent versus a few years ago? Dubas: I think the way that we’ve run our entire program is that we have an atmosphere and environment down there [with the Marlies] that is very similar to the one we have here, and that’s with a huge focus on development. In going through it in the summer and dealing with free agents that are more inclined to be at that level, or when we’re recruiting free agents… so when Jim Paliafito is out recruiting players, or we are, and we’re competing with other teams, it’s been nice to hear that there is a belief our development program is a very good one and compares with the other top ones in the league. I think that is what draws players to it. I don’t think that there are any negatives to going down to the Marlies. The players that go down there know that the team is going to be competitive and the focus is going to be on their individual development. We’ll use that individual development to propel the team to more success. That’s our goal. It won’t change with the Marlies, for sure. Since taking over the role of GM, what is the most challenging part of it so far, and on the flip side, what are you looking forward to most this year? Dubas: The challenging aspect – I think it would be much different if I were going to a different place. It’s really not changed a whole lot. I haven’t changed the way that I am. Whether that’s right or wrong, time will tell. This is me. It’s worked in the past and I’ll continue to try to develop and have it work in the future. I’m not going to change who I am or how I operate. I think I owe that to the staff and to the players that we have here. Just in terms of challenge, it is the highest league you can work in. The other GMs are very astute. They’ve been at it, most of them, much longer than I have in hockey in their role. I think there is a lot that I can learn from them and a lot I can learn from the staff. The staff that we have in management with Laurence and Brandon and our entire group – we also have Cliff and Brendan as well – there is a lot of experience and valuable experience I can lean on when needed. I am very fortunate to have that. What is your perspective of Ozhiganov and Lindholm and how much you were able, if any to sort of watch them leading into bringing them in? Dubas: They’ve been here every day for quite a while. They both made the commitment very early. I think they know it is going to be very competitive. Usually, those higher-profile free agents, they at times think they’re just going to be able to walk in. You can tell by their actions that they know we expect to be a competitive team and that they’re not walking into a guaranteed spot. They know they have to come in and work for it. Both have good track records in the KHL and SHL. I’ve been impressed. This is scrimmage stuff. I don’t read a whole lot into the performance in scrimmage or even in the short term here as they begin to adapt. I’ll start to make greater assessments of them as we get into the weekend and into exhibition. Just in terms of their personality and the way they conduct themselves off the ice and the way they are in the locker room, they both have brought a lot and I’m excited to see them here in an exhibition. They’re not young free agents in their early 20s who have to sort things out. They are guys that have a lot of professional experience as well, so it’s not a surprise they conduct themselves as professionally as they have. When Mike Babcock finished his first year here, he talked about how there were more NHL players than there were positions on the roster. Is that maybe what the management team is most proud of? Whether it’s the fourth line center or the backup goaltender, there is genuine competition everywhere. Dubas: I don’t think any coach is ever satisfied with anything. I think the organization, thanks to the efforts of a lot of people — not just the management group, but our player personnel department, our development department, and R&D department — it’s been a group effort. Because the process has gone the way that it has and we’ve been able to install that, it’s allowed the team to add people and players and progress them along. It gives the coaching staff and myself and the management team a greater selection to pick from. I think that only helps the players as well. They know they’re not walking into a situation where it is one or two people competing for ice time. There is a lot of players here who they know can play. You can never let your foot off the gas. You have to continue to work and develop. In 2014, when I started, we were not where we are now. It is through the efforts of the whole staff, and the player themselves — they’re the ones that put the work in and the ones who play and they’ve been able to push this thing ahead. It is nice to have that competition and we’re looking forward to it come the Fall. 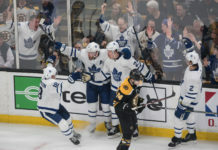 Last week in Chicago, there were a good number of players — Sidney Crosby, Evgeni Malkin, Patrick Kane, Claude Giroux — who said if they could pick one team other than their own that they consider a favourite, they’d pick the Toronto Maple Leafs. Those are big expectations. What are your expectations, and what is your response? These aren’t media members. These are some of the elite players in the league that look at your team and consider them that competitive. Dubas: I think that expectations you can look at two ways. You can look at them as pressure, or you can look at them as an opportunity you have earned. Relative to our players, they’ve earned the respect of their peers through their performance today. Obviously, I think John coming is the thing that has sort of moved our team into that upper echelon. In management, we don’t ever look at things that certain way. We want to build this and continue to abide by our process. Our goal is to sustain this for a long time. It is nice to hear that. It is nice to have those things said about you. But we still have a lot to prove as a group. We haven’t won a playoff series yet, so we need to start by focusing on that today and tomorrow and giving ourselves the best chance we can to contend year in and year out. We have an exciting group of young players and we’ve supplemented that with John and with some of our others. For now, for us, I don’t look at this like there is any deadline on it. We want to be a team that is in it every year and that gives ourselves a chance every year. I think the players have earned the right for other people to be excited about them. I don’t think they should shy away from it or let it inundate them or cause pressure for them. They should be excited about it. In anything that you do in life, if people have expectations of you, it means you’ve earned them and you have talent. They believe you can reach a certain potential. I think that is a testament to the players we have and their talent, and the work that they’ve put in so far. Tyler Ennis has been around the league for a while but is coming off of a couple of disappointing seasons for him. What made you look at him and want to bring him here and give him a fresh start? Dubas: I think we looked at Tyler as a clearly very talented player and a skilled player. When looking at what we needed to add to our team, he was in a unique circumstance. It didn’t work out for him in Minnesota, but we’ve been able to see in Buffalo what he is capable of in terms of his talent. We thought that, given that he was exiting Minnesota, we could bring him in and work with him. He was willing to put the work in and voluntarily bring himself here in the summer to work repeatedly with our performance staff and our strength and conditioning staff to ready himself for the season. When we spoke to him on about July 2nd or 3rd, once his situation in Minnesota had ended, it was clear that he knew he had a lot at stake moving forward. We just thought we could provide him with a great opportunity for him to get back on track and rolling again. That was part of it. Seeing him and how hard he worked in the summer kind of gave validation to what he said he was going to do. We are excited about him. He is going to get a great opportunity off the start here with Auston, and we’ll roll from there. On the backup goaltending situation, three guys are coming in on one-way deals. Assuming Frederik Andersen is on the team. Dubas: That’s a good assumption. With Curtis, Sparks and Pickard, all three had tremendous seasons last year. How do you foresee that situation playing out? Do you worry about maybe the risk of losing a younger player as a result of waivers with that being the case? Dubas: The goaltenders — I think we’re fortunate. You plan it to have it come out that way. We had signed Garret and Curtis to two-year contracts in 2017, and then we traded for Calvin early in the year last year to solidify our depth at the position. He had a great year with the Marlies. Sparks was the goalie of the year, and Curtis had a great year in the NHL. The forgotten guy that doesn’t get mentioned a lot is Kasimir Kaskisuo. His statistics were in the top 10 in the American league when we loaned him to Chicago. We’re excited about it. It’s a position you always want depth for rather than trying to search for it when things don’t go well. I think we are in a very fortunate position with the talent of all of those four, in particular, and the character and what they’re about as people. We’ll see how it plays out here. All of them are going to get a great opportunity in training camp and exhibition to have the chance to continue to prove themselves. We’ll make the decision that is best for our team now and moving forward. It’s customary for the GM to address his team at the beginning of the training camp. If you haven’t done it yet, what will your message be and what are your thoughts on that? Dubas: I think that’ll be tonight in Niagara Falls. It’ll be my first time doing it at this level. I’ve done it with the Soo and the Marlies in the past. I think the key message — I try not to be longwinded and keep it to a very specific message — for me is going to be, with the expectations on them and with the talent of the group, we can have success if we abide by our process every day. What each player does every day, and what we do as a management group every day and a coaching staff every day, to help us get better as the year goes along — we can have great success if we do that. But it’s about not looking too far ahead to the Spring or the playoffs. We have to get there first and set ourselves up for success once we get there by how we perform day in and day out during the season. It’ll just be about continuing to push our group to be more process oriented and not worrying about what the fans or anyone else says about what our potential is at the end of the year. We are not going to get to that point if we don’t focus on the day to day and do everything that we can to maximize our potential individually and as a group day to day. That will be the extent of it. My message doesn’t really change too often from year to year. It tends to always go back to that. We’ll roll with that. Further to the question about the goaltending situation: You have guys like Justin Holl and Frederik Gauthier, who would have to clear waivers if they were to be sent down to the Marlies. How much of that is a factor in the final decision process when it comes to keeping them or sending them down? Dubas: I think every element of a player’s status factors into the decision you make about them — how they perform, what their contract situation is, what their waiver situation is. I think the two players you are talking about specifically have performed well at the NHL level and were obviously key parts for the Marlies all throughout last year. Freddy played against the other team’s best players every shift and Justin Holl played against the other team’s best players every shift. They all had success. I should say Holl and Marincin played together as a the number-one pairing on the team. For us, they’ve proven ourselves to the organization over the years. I’m excited to see them continue to develop here in training camp and exhibition. They are very valuable members of the organization to us and I’m excited for how they performed last year in the Spring and to continue to see them develop here in the Fall. We knew all about Lou’s rules. Can you enlighten us on Kyle’s rules and if facial hair will be one of them? Dubas: It’s interesting, and I realize the implications of it and I certainly respect why Lou… Those were his rules in New Jersey, they will be the rules with the Islanders as well. I have a bit of a variation in my belief. These players, if we go to what everyone wants to be our ultimate destination in time — year in and year out — we are asking for nine months of their lives. We are asking them for nine months. When you ask somebody to commit that amount of time, it’s not just them; it’s their families. I want the players to be at their best, whatever their individual best may be. I think part of that is letting them really express themselves — in a professional manner, but to try to be themselves as best as they can. It’s something I have gone back and forth with over the summer, but ultimately what I have landed on is doing what I had done before. I understand some people may like that and some may hate it, but that’s our decision and that’s what we’ll do.